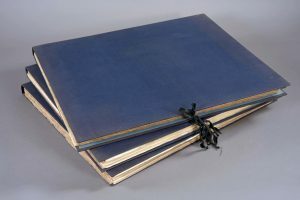 One of my more recent projects has been working on this gorgeous late 19th century Japanese photograph album. 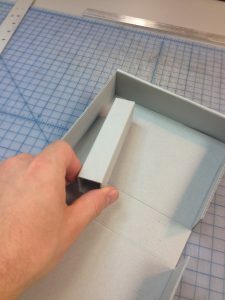 While I’m still dealing with the album itself, today I’d like to briefly share some steps I’ve taken to stabilize the decorative paper box in which the album was originally purchased and stored. 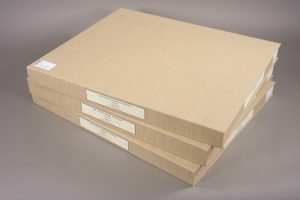 When the album came to the library, it was inside the original enclosure, and both album and enclosure were packed in a regular cardboard box with medical underpads as cushioning material. Unsure of what I was really looking at, I documented the object exactly as it came out of the cardboard box – underpads included! The underpads do have some merits as packing material, providing both cushioning and a moisture barrier. 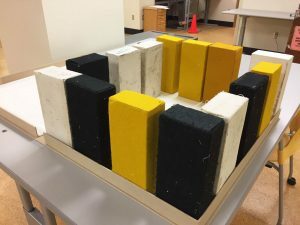 They are not the best long-term storage materials, though, so we opted to remove them. As you can see, the box was looking a little rough. I removed the photo album and laid out each piece of the enclosure to better see what remained. 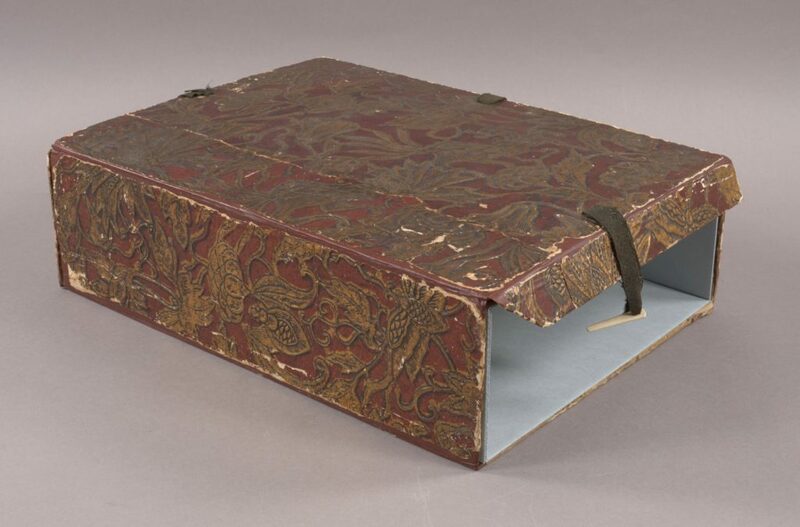 The enclosure is essentially a drop-spine box, covered in decorative red and gold paper. 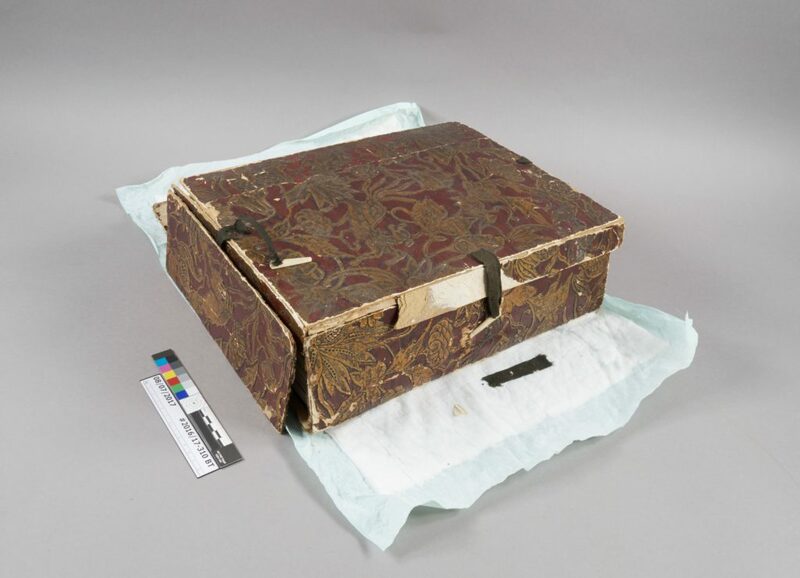 Yellow textile pads are included in the interior of the lid and base to protect the lacquer and ivory covers. 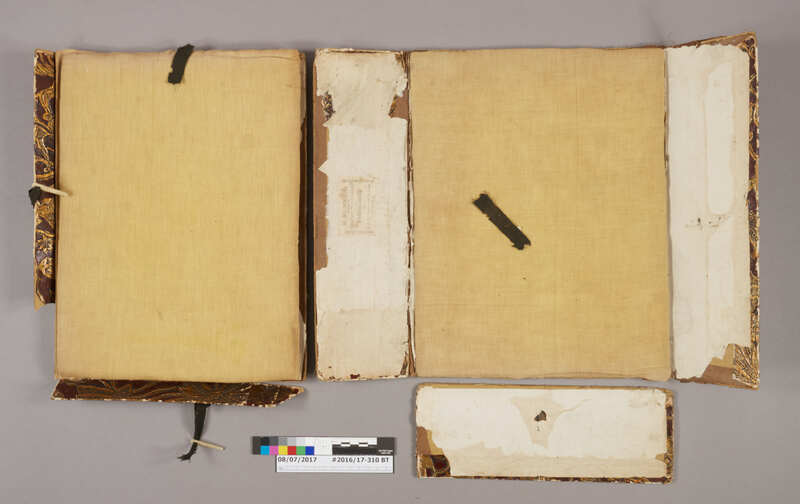 The head, tail, and fore-edge of the lid have black woven textile straps and bone pins, which originally fastened to small woven textile loops laced through the lower tray walls. As you can see, several parts of the box are missing and most of the joints have broken. The straps are also broken in several places and very weak. This enclosure is special because it includes a great deal of information about the album’s provenance. Kusakabe Kimbei (1841-1932) is widely known for these souvenir albums, consisting of hand-colored portraiture and scenic views. 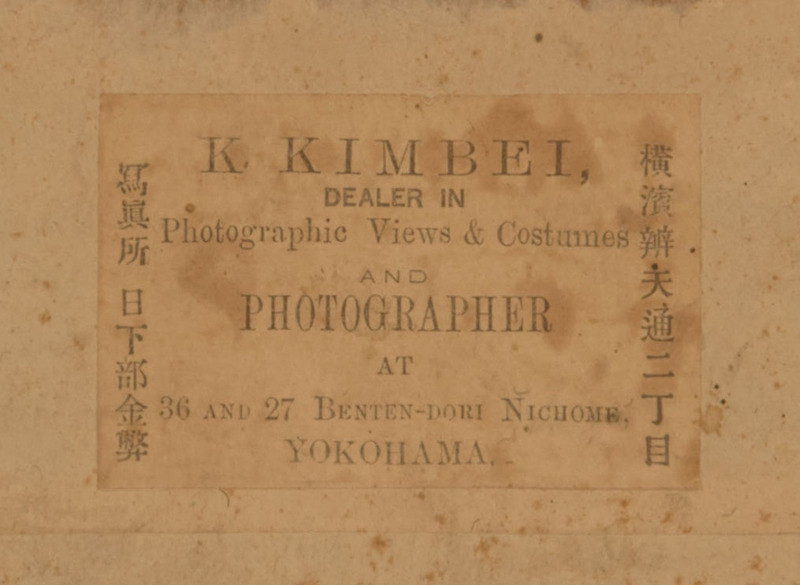 Bennet (2006) describes Kusakabe’s (1841-1932) businesses at the two Benten-Dori addresses: 36 functioned as a photography studio, while 27 operated as a shop where composite albums of Kusakabe’s prints were sold (p. 135). 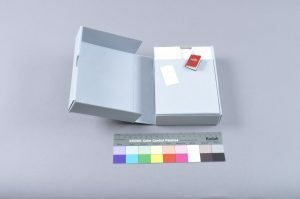 We want to ensure that researchers can open and closely examine the enclosure to see the information on the interior label, but it is not necessary for the heavy photo album to remain inside. 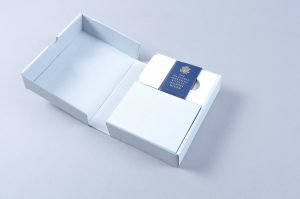 The decision was made to create a new padded enclosure for the album and stabilize and store the original enclosure separately. 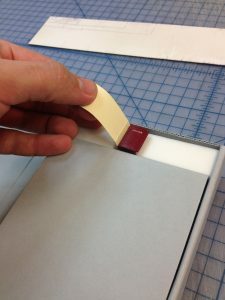 I began by re-assembling all the box pieces in much the same way I might repair the joints of a paper binding. Using the patterns on the decorative paper, I was able to match all the detached pieces. 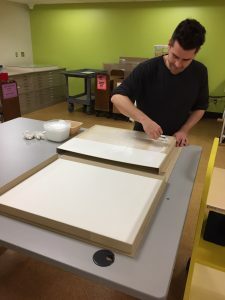 The original decorative paper was lifted away from the boards and strong handmade paper, toned to match, was adhered underneath with wheat starch paste. I stabilized the remains of the textile straps using toned 60/3 linen thread. 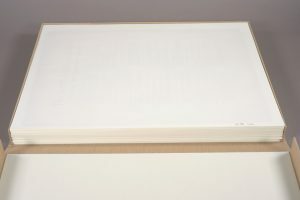 Since the enclosure will not contain the heavy album anymore, the decision was made to just reattach and stabilize the extant materials, rather than recreating the lost walls of the tray and edges of the lid with new board. With only two walls on the bottom tray, I decided to construct a small corrugated box to fit inside and act as additional support. 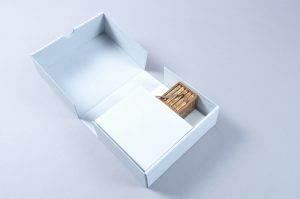 The “filler” box is light weight and can easily be removed by a researcher. 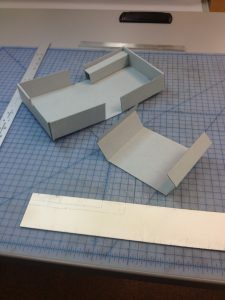 This set of two boxes will get a final, outer box to protect the textile straps. A box, within a box, within a box. Bennett, T. (2006). Old Japanese photographs: Collector’s data guide. London: Quaritch. Not actual collection buttons, just some of the many buttons we have in the lab. The Rubenstein Library holds a growing collection of political ephemera including many political pins. 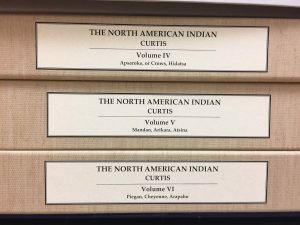 Over time the library has received multiple additions to the collection and expects to continue collecting more of these items in the future. The collection arrived in batches with a variety of different inconsistent housing methods. At first, conservation had been creating custom built trays with individual spaces for each button as seen in this Duke Today video. 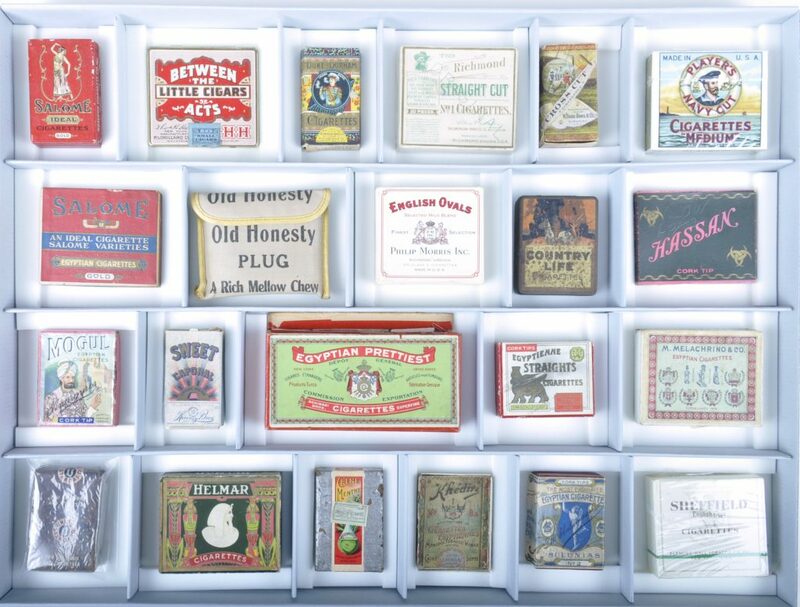 Here is another example from the Terence Mitchell Collection of Tobacco Related Ephemera of the kind of tray we were creating for the buttons. This approach resulted in a really nice custom enclosure for a group of buttons, but was time consuming to create by hand and inconvenient when just one or two new buttons would need to be added to the collection. After a meeting with Rubenstein Library curatorial and technical services staff to assess the state of the entire collection and discuss goals for the future of the collection I started researching housing options. 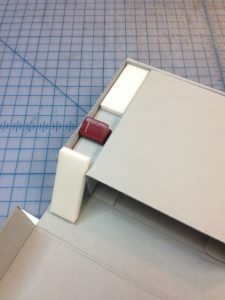 I remembered seeing a method for housing buttons by pinning them on to foam covered boards but many of our buttons didn’t have their backing pins and there was no way to number individual items using that system. I had also seen a method for housing small artifacts that looked like it could be promising with a little modification. Now we house each button using a clear 4″ x 5” zip top, virgin polyethylene bag with a 40 point tan barrier board stiffener inside. The bags are either 4 mil or 6 mil so they are strong and provide some cushion. I cut the barrier board to be small enough to easily slip in and out of the bag and I round the corners so they don’t fray or poke through the plastic bag. The pins aren’t attached to the stiffener backing but it provides structure and support for the different sized items. The top of the stiffener can be labeled with an item identification number if needed. 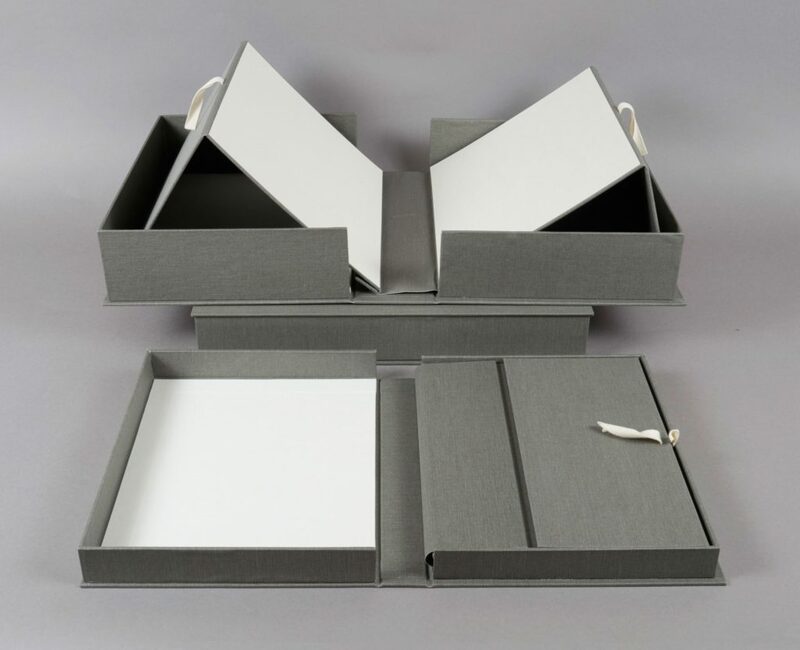 Then the bags can either be housed flat in trays or upright in shoebox style archival boxes. This method makes it easy to house large numbers of buttons quickly and is easy enough for technical services staff to assemble these housings themselves. 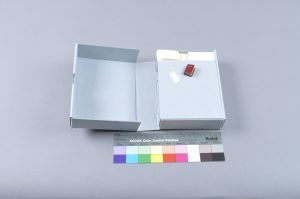 When one or two new buttons arrive to be added to an existing collection, they can easily be bagged and filed in place in an existing box. It is also still easy for researchers to flip through a box and look at each button without having to handle the actual item. So far we’ve been really happy with this solution and I imagine it could be adapted for housing other small ephemera collections in the future. 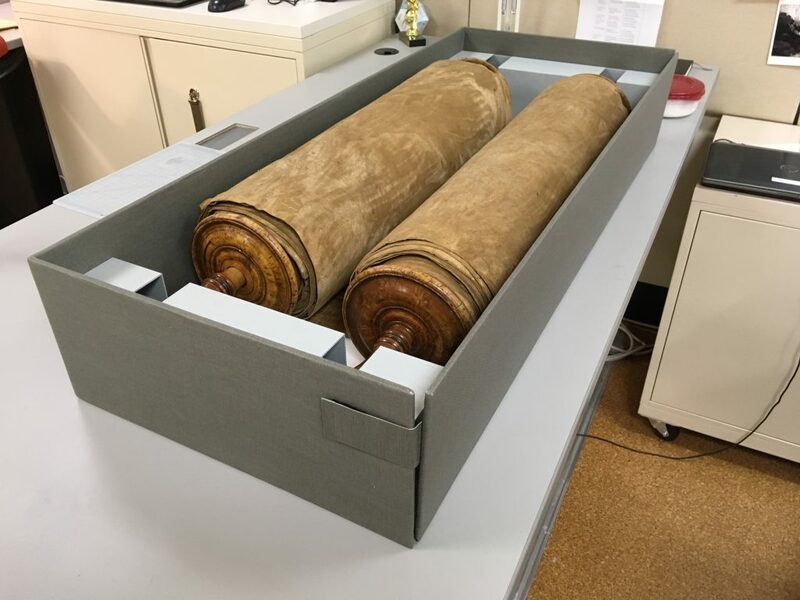 The Rubenstein Library recently acquired another large Torah scroll. 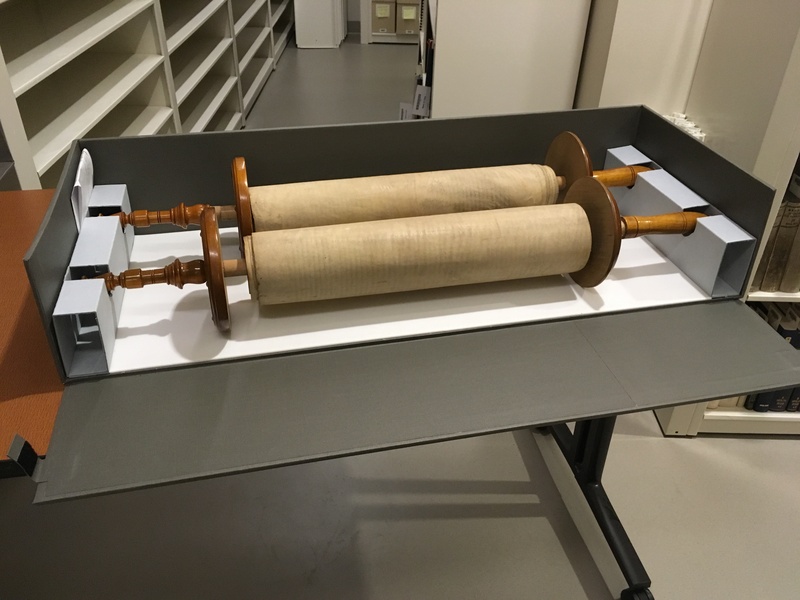 Measuring 40″ in length, these scrolls can be quite heavy and difficult to move safely. 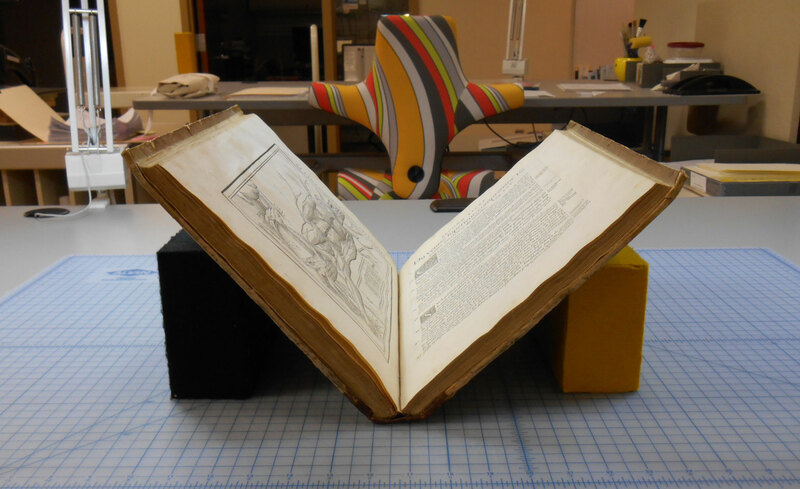 The support on which the scroll arrived was minimal and inventive. The scroll was wrapped in layers of cotton muslin, with cotton twill tape laced through honeycomb board to secure it. 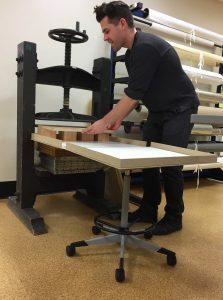 Honeycomb board is light enough for two people to easily lift, but rigid enough that it doesn’t bow or cause the scroll to shift. At the time of acquisition, we discussed keeping this support. 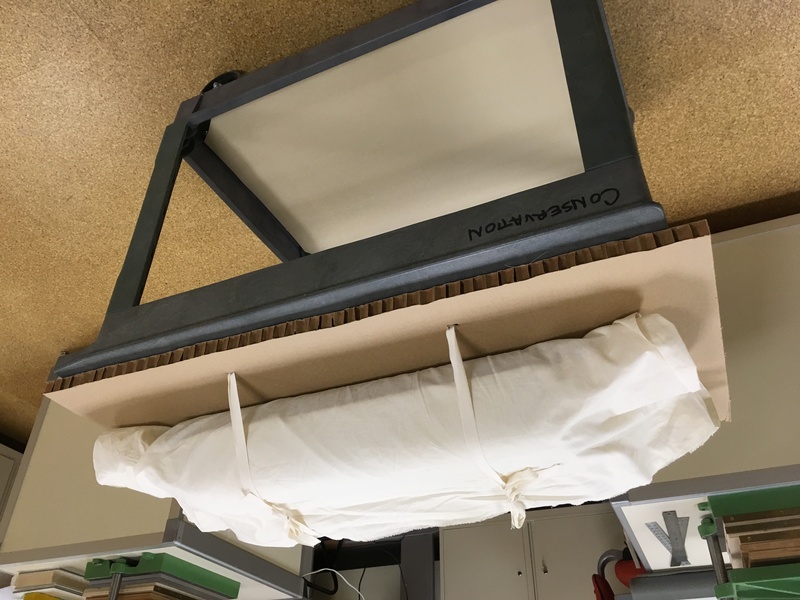 After considering the necessary handling and pathway through the building to serve the scroll in the reading room, however, it was decided that a full enclosure would offer more protection. Longtime readers may remember when Beth boxed a similar scroll a few years ago, and more recently you might have seen Tedd’s series on Extreme Enclosures. 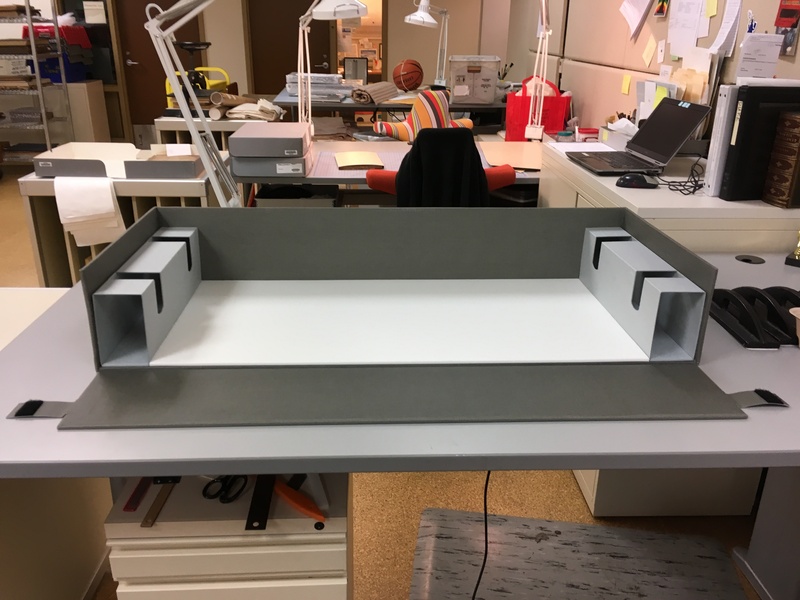 Each of these large enclosures employs double layers of corrugated board, covered in buckram, to cut down on weight while remaining durable enough for long term handling. Beth’s Torah enclosure is nearing its seventh birthday, so I thought this would be a good opportunity to see how it has aged. Can the double-wall corrugated board really stand up to the abuse of regular handling and re-shelving? It turns out the box (pictured above without its telescoping lid) is still in very good shape. 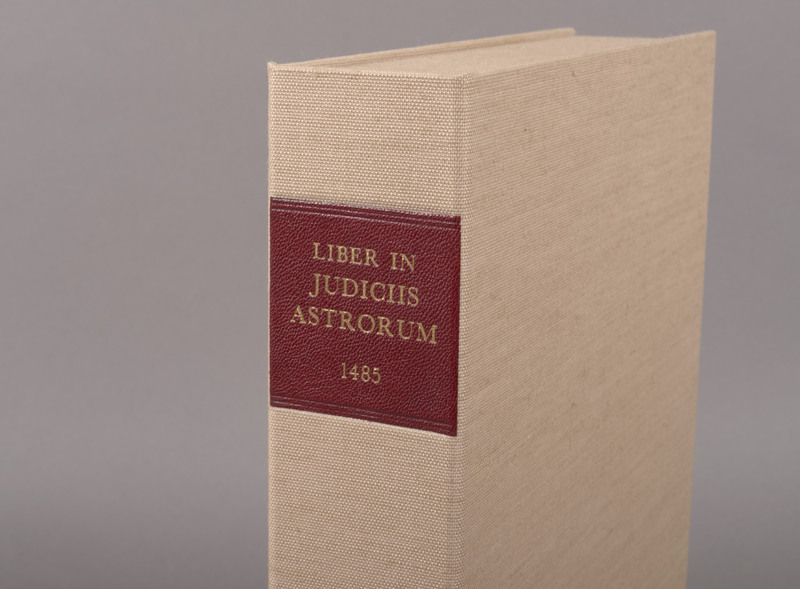 Despite many trips to the reading room and all the activity of the Rubenstein Renovation, the enclosure shows no wear or distortion from the weight of the contents. 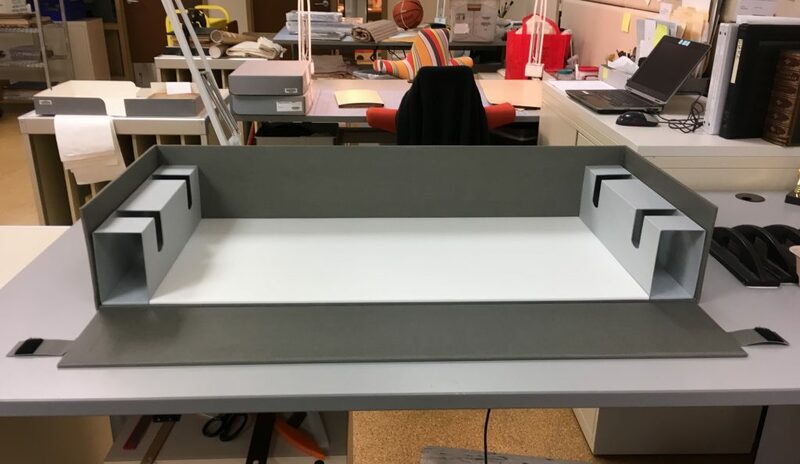 Research Services staff report that the lighter weight makes re-shelving (with two people) quite easy and the drop-wall design allows for convenient removal of the heavy scroll from the box. Considering the success of the first box, I decided to adopt the popular idiom of “if it ain’t broke, don’t fix it” and duplicated the design for the recently acquired Torah. 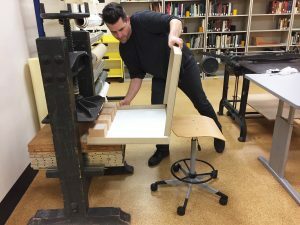 Library conservators are often called upon to creatively engineer solutions to unique preservation problems. 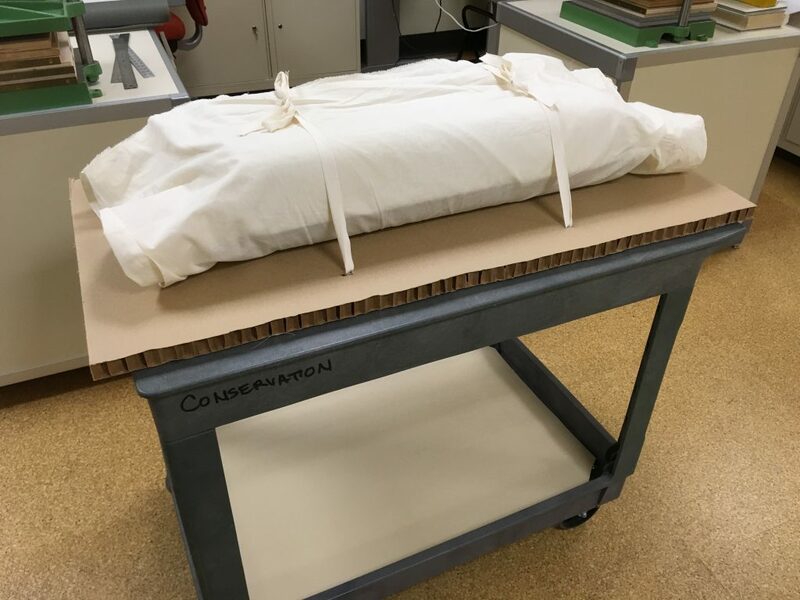 With ever growing and diversifying collections, it sometimes feels like all our attention is pulled toward the next object coming through the door. It’s nice to have the opportunity to go back and critically review some of those solutions, but nicer still to see that, years later, they are still working as they should. The name Southworth jogged my memory. Back in May we were treating True Flag, a newspaper published in Boston from 1851-1908. 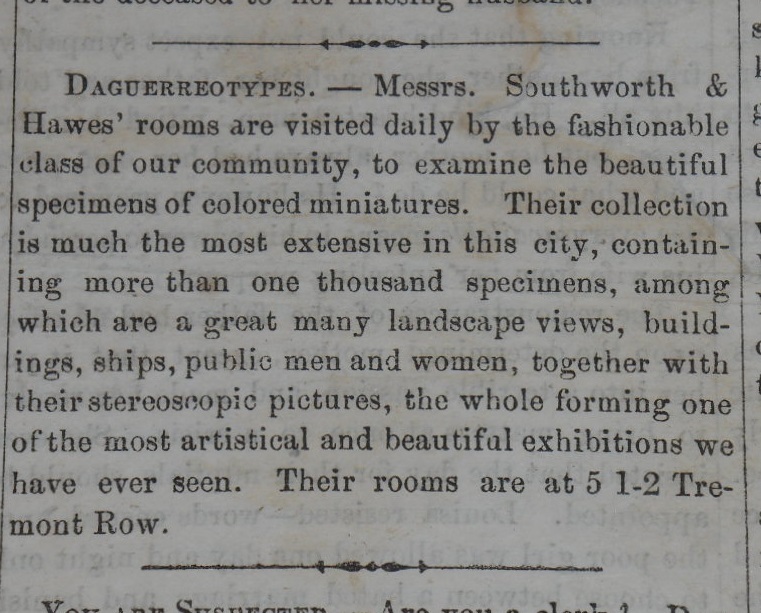 While encapsulating an issue from Saturday July 15, 1854, I had noticed an advertisement for daguerreotypes and taken a photograph of it. 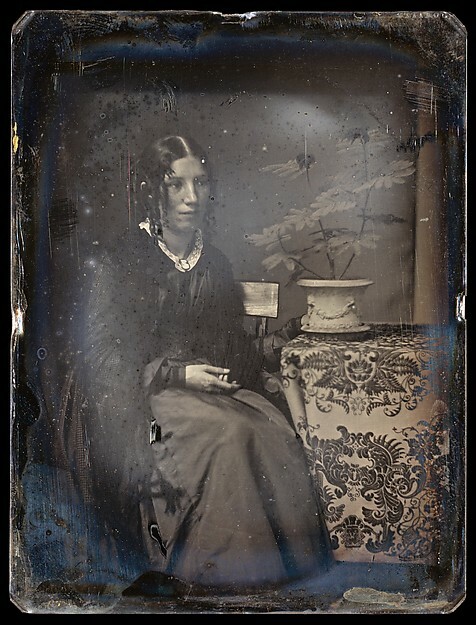 Southworth & Hawes was a prominent photography business active in Boston in the mid-1800’s and well known for their portraits of notable people of the day, including Henry Wadsworth Longfellow, Ralph Waldo Emerson, and Harriet Beecher Stowe. 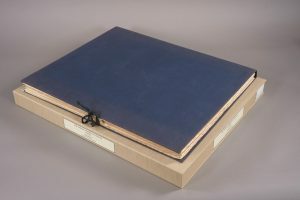 The daguerreotypes of Albert Sands Southworth and Josiah Johnson Hawes are held today in the collections of The George Eastman House, The Metropolitan Museum of Art, and the Museum of Fine Arts Boston. Like the backdrop on class picture day, it looks like certain props and settings were used repeatedly in the studio of Southworth & Hawes; A table with a floral patterned cloth, a potted plant, and a book seem to have been an especially popular combination of props. The specific fern-patterned cloth draped on the table beside Philena even makes an appearance in a number of other photographs. 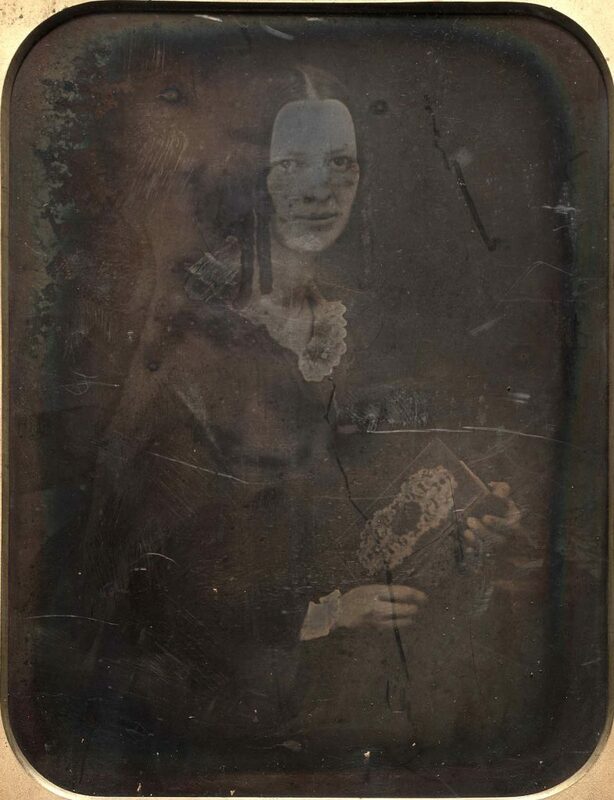 A daguerreotype of Harriet Beecher Stowe at The Met looks especially similar. Along with celebrities, Southworth and Hawes took a number of photographs of their own family members. 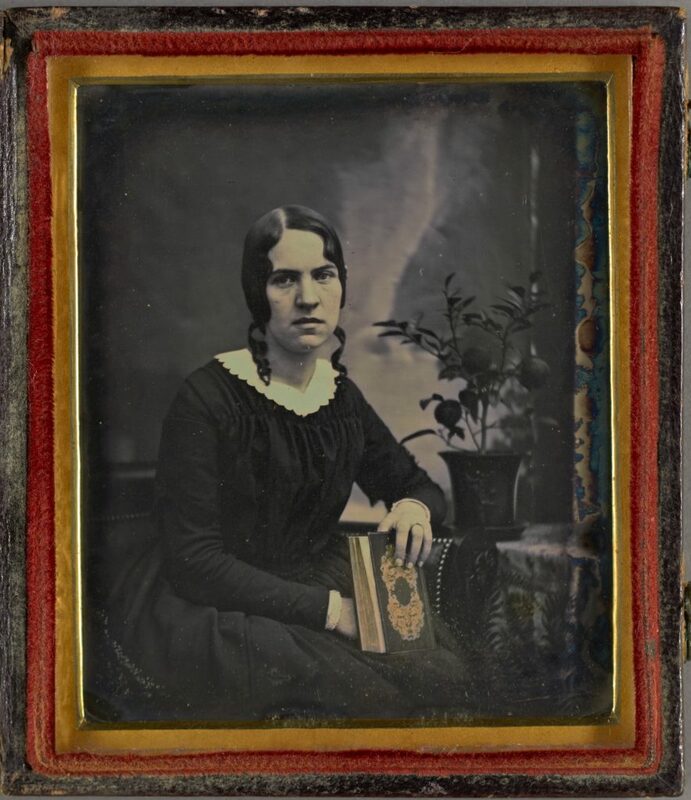 Although not the best example of their work, in this photograph of Nancy Southworth Hawes (wife of Josiah Hawes and sister of Albert Southworth) at the MFA in Boston, she appears to be holding the same highly decorated book as Philena. Unlike the fern-patterned cloth and potted plant that popped up again and again, the photo of Philena and the photo of Nancy are the only two I found where this specific book was identifiable. I wonder if the book was just another prop sitting around the studio for patrons to use, or if it held some greater significance. Interestingly, Albert and Nancy Southworth grew up on their parent’s farm in Fairlee, Vermont; less than 10 miles from Philena’s childhood home in Bradford. 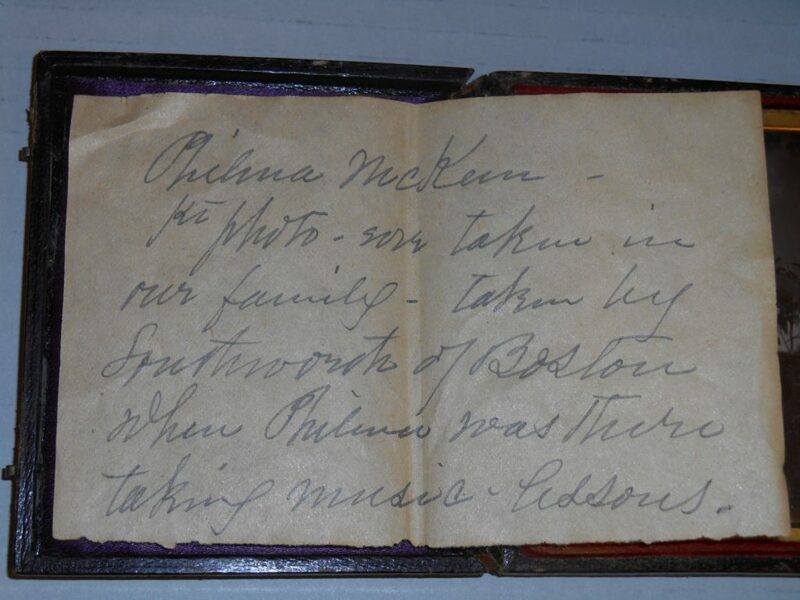 Is it possible these two families knew each other before meeting again in the Boston photographer’s studio? 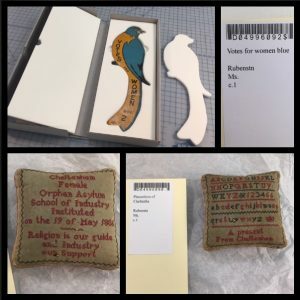 One can really go down a rabbit hole when it comes to making labels for book enclosures. In addition to considering the layout and typeface, there are a number of materials and printing or gilding techniques that can be used to create one. Stamped leather labels are certainly a nicer option, but require special equipment and are very time consuming to produce. Paper labels are very quick to make, especially in large quantities, and everyone has the necessary equipment. With a little effort in setup, paper labels can look surprisingly good on a box. One of the major problems I have had with setting up paper labels digitally is the lack of spacing control between lines or between letters that one has with a hot stamp or handle letters. 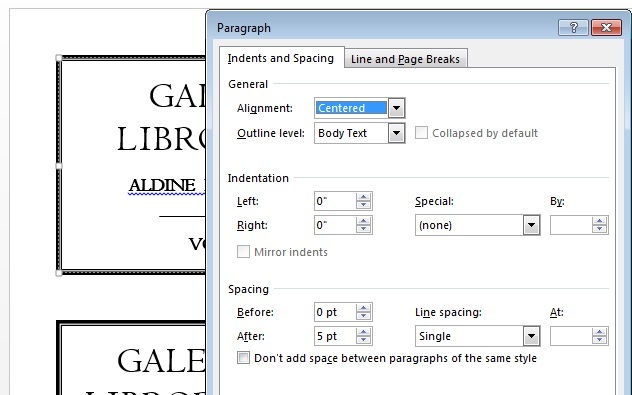 Common word processing software doesn’t make this type of layout work easy; however, I have recently discovered some simple tricks in Microsoft Word that can be employed to achieve a more pleasing arrangement of text. When setting up a label in Word, I will often start with a simple text box. Before typing any titling text, I set the dimensions of the text box based on measurements from the spine of the enclosure. 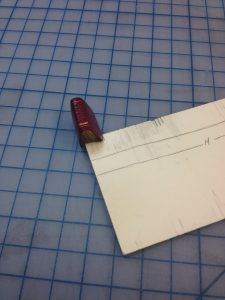 I will also set the box to have a compound line (thick and thin) to look more like traditional tooling. There is a lot of literature about choosing typefaces and laying out book titling, so I won’t get into any of that here. Let’s just focus on spacing. With the text generally arranged and sized to fit, I will start adjusting the spacing between lines, commonly referred to as “leading“. Word seems to default to multiple spacing between lines, so I remove all of that first. With all the text selected, right click and select Paragraph. After setting the line spacing to Single, you can then customize the point spacing after each line to achieve the leading you want. Next you may need to adjust the spacing between letters, also known as kerning. The example below uses Centaur as the typeface and, on the left, you will see some bigger variation between letter spacing. Compare the “IB” to the “RO” spacing in “LIBRORUM”. On the right, I have adjusted the letters to have a more uniform appearance. I find this spacing more subtle on a screen, but much more obvious on a printed label for some reason. The kerning is adjusted in a similar way to the leading: with a letter highlighted, right click and select Font. 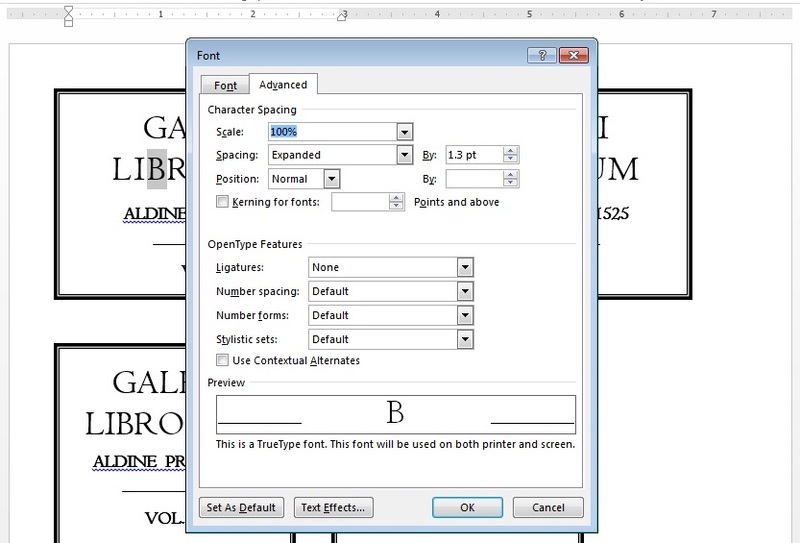 Under the Advanced tab, you can choose Expanded or Condensed spacing and modify it with a number. In this example, I expanded the spacing of the I and B and reduced the spacing for the R.
I find that a little consideration to spacing makes a huge difference in the look of my book titling and labels. Hopefully these simple modifications can come in handy for other folks, too. Welcome to Part Two of EXTREME ENCLOSURES: Miniatures. 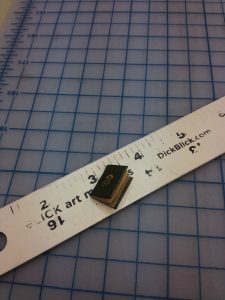 If you ever want to feel like some sort of extreme being (a giant, perhaps, or even better: Andre the Giant), you may want to take a gander at the tiniest books that Rubenstein Library has to offer: the miniatures. The raw power you feel when holding five leather bound books in the palm of your hand is astounding. 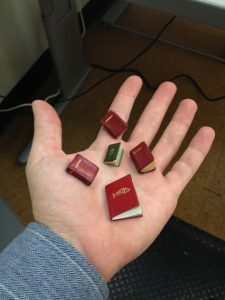 Rubenstein has almost two hundred miniature books. 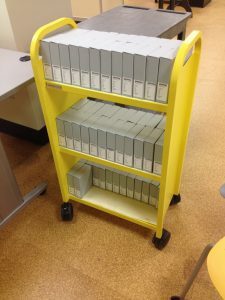 These little guys, known as The Minis, are often bullied by the notorious “big boys of the stacks.” Once again, Conservation has to step in to take care of at-risk books. We needed to help the Minis bulk up so they are not beat up by larger books or lost in the wild (albeit highly climate controlled) world of the stacks. Do not let the sense of “being huge” go to your head when handling the miniatures. 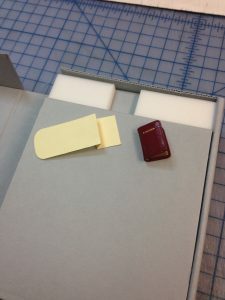 The miniatures had previously been housed in folders within document boxes; usually a dozen or so in each box. 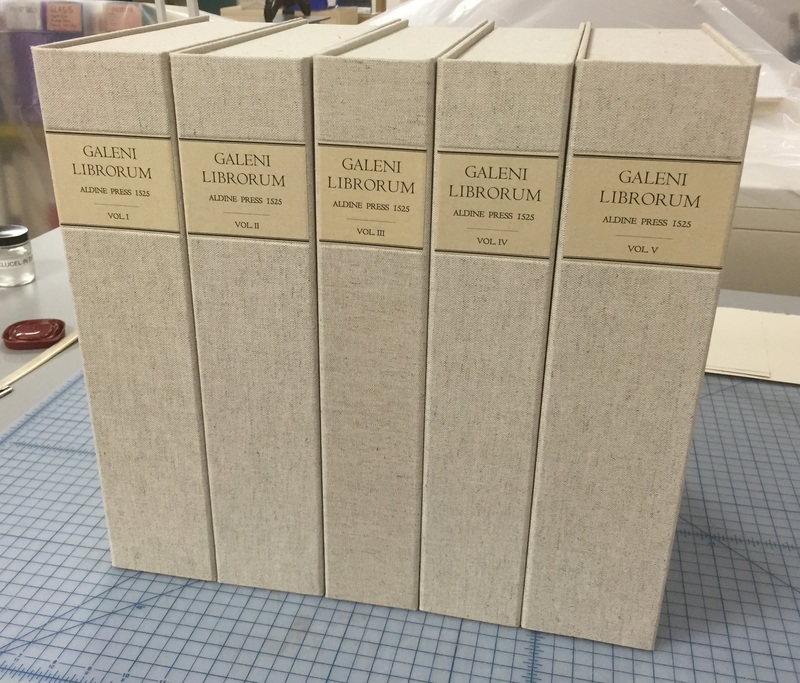 One may handle multiple volumes before finding the one they wish to access. Once the desired volume is finally found, it can be easily lost due to its miniscule size. To facilitate handling we wanted to house them individually in standard size corrugated clamshell boxes (aka “pizza boxes” or “drop spine boxes.”). First we had to decide on what that standard size would be. The height of the standard box was set by the 8-inch-high shelves. To determine the width and depth of the standard box, I measured each miniature to find the largest amongst them. 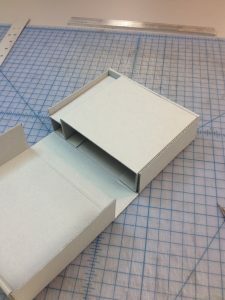 I settled on a standard box that would measure 6 inches x 1.75 inches x 4 inches. An added advantage to a standard box is the ability to batch tasks. 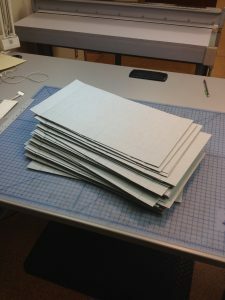 I would measure, cut, and crease 30 or so clamshells at a time, saving a lot of time. A pride of Minis in their new homes. Once I had the standard clamshells figured, I had to determine how to settle the books into their new houses without them rattling around. I wanted to keep the inserts simple and intuitive. After a few experiments, I chose a two-tiered system of spacers made from corrugated board adhered with double stick tape. I added Volara and 10 point card stock tabs to further stabilize when necessary. Watch as this Mini “Addresses of Lincoln” gets a house. I used the Mini to determine the height and width of the first spacer. Inserting the first spacer with double stick tape. I used the space left in the box to determine the size of the 2nd spacer. Inserting Volara. Those Minis love a good foam party. I used the height and width of the Volara recess to determine the tab size. The tab allows for easy retrieval of the Mini. When finishing up the nearly two hundred enclosures for all these vulnerable Minis I rejoiced. 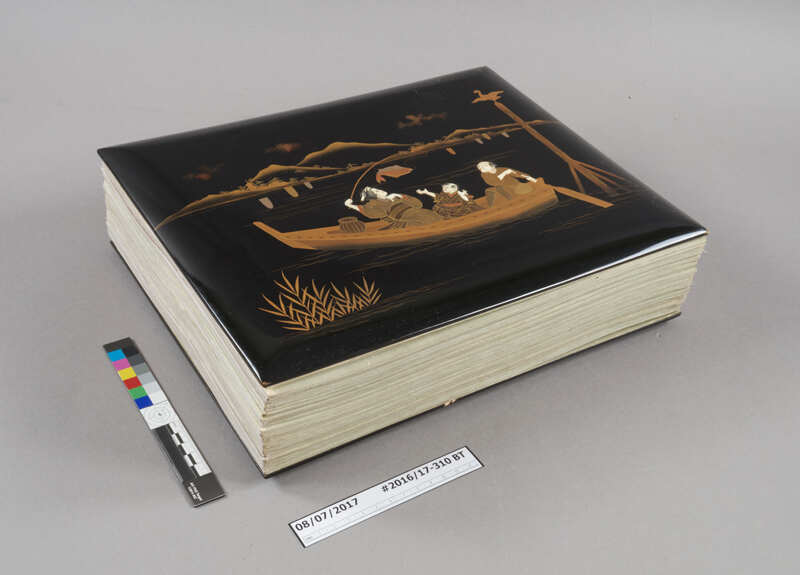 Knowing how intimidating other large volumes can be to the slighter books in the collection, it’s nice to know a conservation technician can make a petite book’s size anxiety just a little less extreme. I am comforted that the Minis now rest easy: safely tucked away in their soft foam and supportive board havens, never to feel lost or intimidated again. A vulnerable mini prior to receiving a house. Be sure to visit part one of Extreme Enclosures: Boxing the Audubons.